I started at Boston Children’s Museum as the Elvira Growdon Intern for Collections and Archives Management. After completing Masters in Library and Information Science at Simmons University, I am now working as the Archives Coordinator here at BCM. I love discovering and sharing interesting parts of the Museum’s history, from Pet Show entries to MATCH kit materials. Delia Griffin was born in Maine and educated at the Bailey School and Kent’s Hill Female College. She became supervisor of nature study at the Newton and North Attleboro, Massachusetts schools where she introduced school gardens and bird walks, and created lesson plans for teachers. 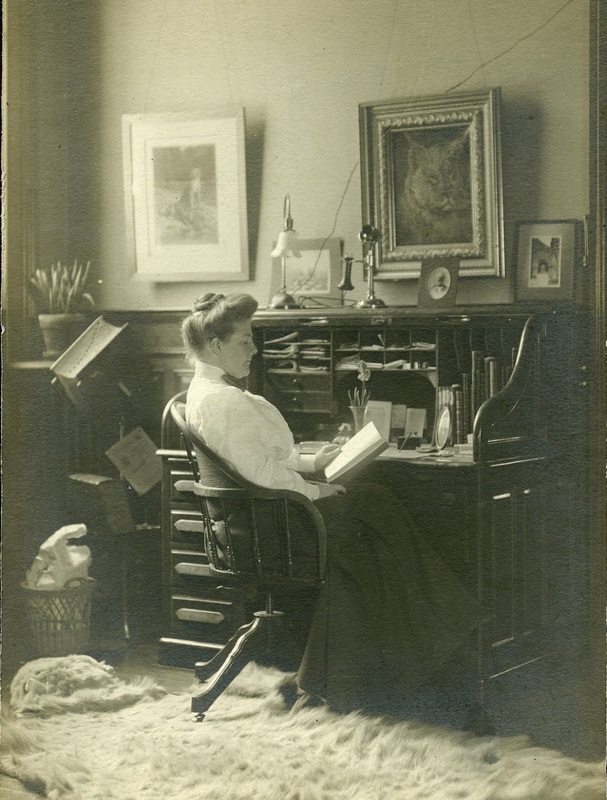 She became Director of the Fairbanks Museum in Vermont for 10 years, where she revolutionized museum education for children. She developed live exhibits with hundreds of specimens and enhanced the historical department by creating new displays and hosting lectures. Griffin accepted the position as Curator at the Children’s Museum of Boston and began work on its opening day, July 1st, 1913. At the Boston Children’s Museum, Griffin wasted no time filling the rooms with natural history and ethnological exhibits, a lecture room and a library. She ensured that display cases were created at a child’s eye-level, and that labels were written at an appropriate reading-level. Griffin led nature walks and encouraged local scientists to lead expeditions as well. She mentored groups of children creating their own clubs which would meet at the Museum. One club created a monthly magazine about happenings at the Museum, called Our Hobbies. They had yearly subscribers from many New England states, Japan, England, and Belgium. The Loan Department also grew under Griffin, creating kits of materials that teachers and groups could borrow. She collaborated extensively with Boston schools to ensure that the Museum and school curriculum worked hand in hand. The Museum presented lectures designed to complement children’s lessons and each month sent a bulletin to schools to alert them to upcoming events. In only the second year of the Museum’s existence 297 classes visited, representing more than two thirds of Boston school districts and serving over 10,000 children. Griffin bolstered Museum activities during World War I to help keep children occupied as schools and libraries closed due to coal shortages. Extra events were planned for school vacation weeks, such as special nature collecting excursions and patriotic films. Under Griffin’s leadership Museum programs experienced huge growth, and in 1925 served 90,000 Boston students. Griffin directed the Museum for 14 years until 1927. Delia Griffin had a deep and wide-reaching impact on Boston Children’s Museum, education in Boston and the formation of children’s museums around the nation. “Rare Work by Miss Griffin.” Boston Globe, June 21, 1913. “New England Portraits: Miss Delia I. Griffin.” Boston Herald, November 26, 1926. Sayles, Adelaide B. The Story of the Children’s Museum of Boston. Boston: Geo. H. Ellis Co., 1937. Being the archivist at Boston Children’s Museum means that I often come across little tidbits of information that I want to chase until I have the whole story. Recently, I came across the photograph above, of two children and a goat. 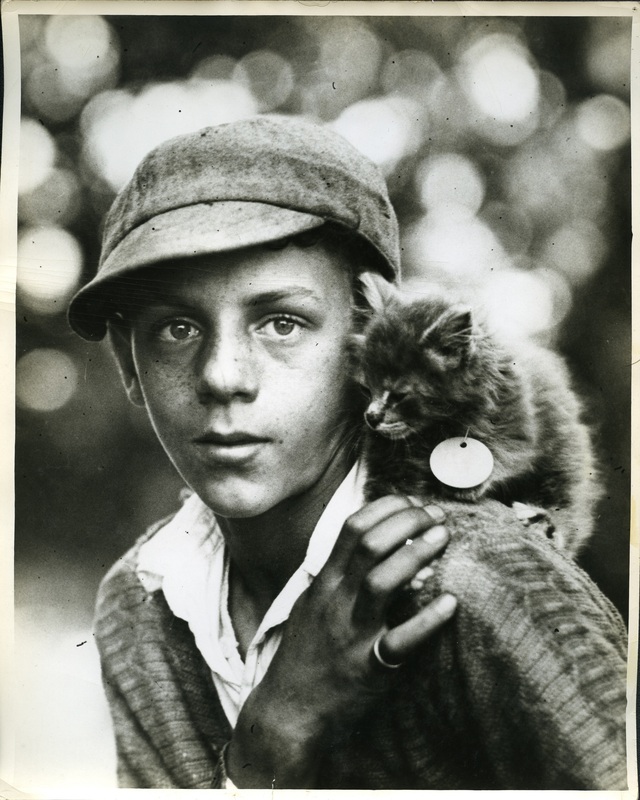 Thankfully, the back of the photograph was labelled: “Jack Dixon and His Goat, Pet Show June 1928.” From there, I could hunt down more images of children and their pets by perusing the 1920s-era photograph albums in the archival collections. 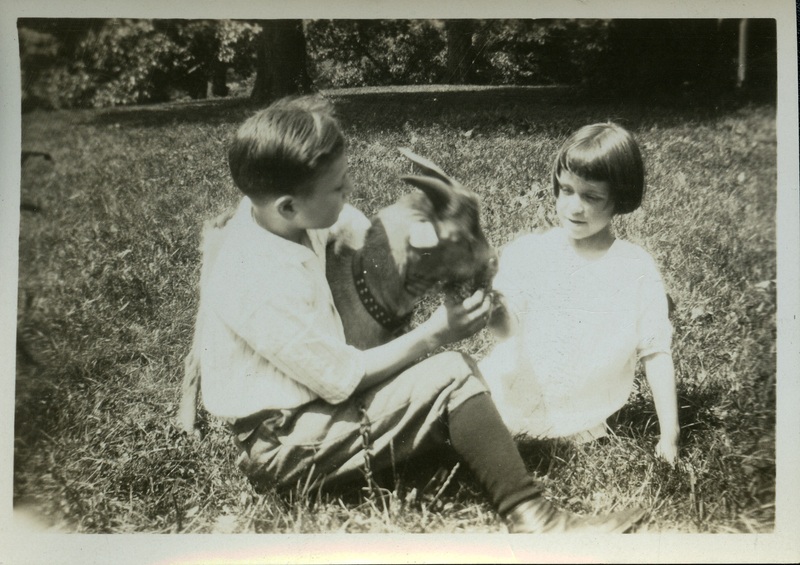 I found images of children with more traditional pets including cats and dogs. 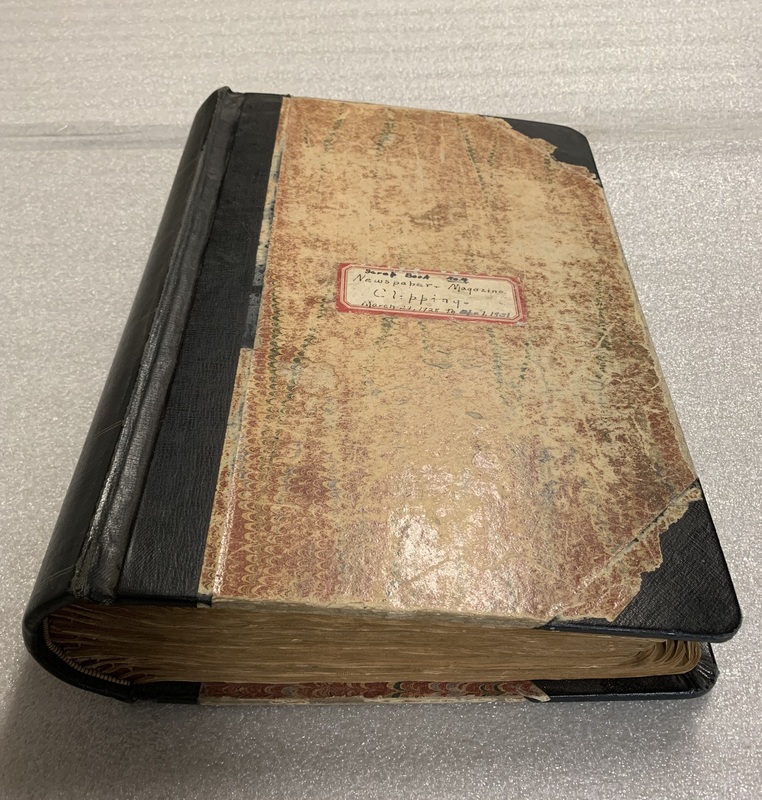 I then turned to one of the most valuable resources in the collection, scrapbooks of newspaper clippings about the museum. 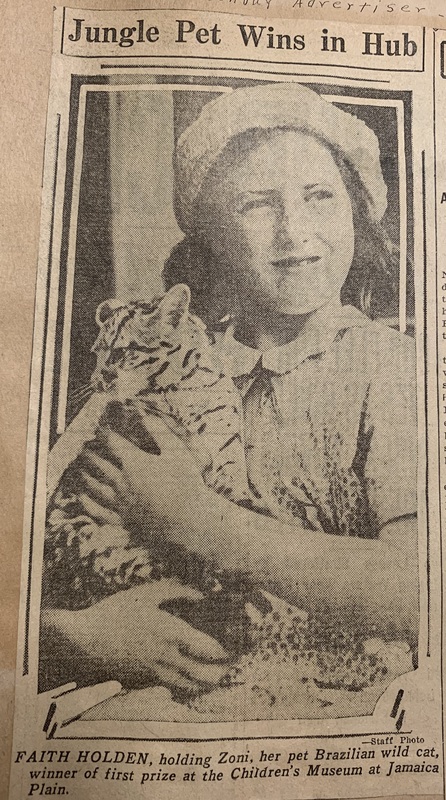 The scrapbook that covered 1928-1931 included multiple pages of coverage of the Pet Show, with some articles multiple pages themselves, so the readers of Boston were well-apprised of the happenings. 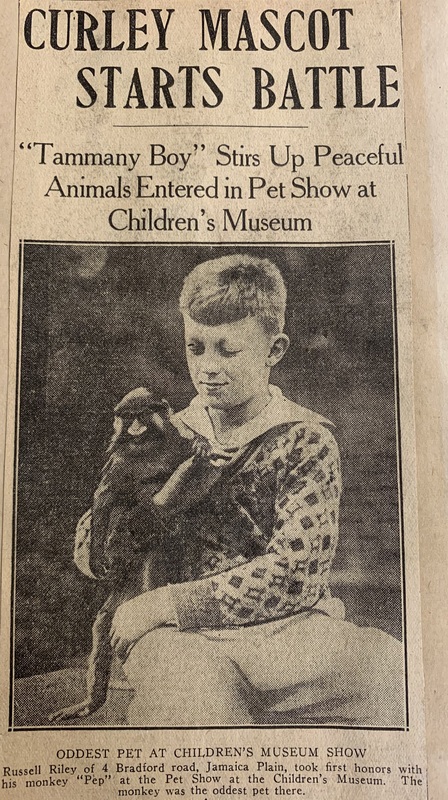 On June 16th, 1928, Boston Children’s Museum held a Pet Show requesting remarkable, unusual, and intelligent companions. The children of Boston responded, and brought all sorts of creatures to the lawn of the Pine Bank building on Jamaica Pond. These included the expected cats and dogs, but also chameleons, turtles, Japanese waltzing mice, parrots, goats, geese, canaries, tree toads, snakes, rabbits, hens, a salamander, and a Brazilian wildcat. Prizes, in the form of ribbons and books, were given out for different categories and classes by Mrs. Huntington Smith, founder and president of the Animal Rescue League. Zuni the wildcat won Most Unusual, while the tree toad won Most Remarkable. Prizes were also given for the winners of the essay contest “What My Pet Knows.” These winners included Edward Russell about his Angora cat Fluff, and Virginia Coolen about her collie Scrapper (who also came with her 8 puppies). Last of the day was an illustrated lecture from the Animal Rescue League on “How to Keep Pets.” All of the newspaper articles described the day as successful, with children gaining the opportunity to speak about their best friends, while also learning about the pets of others. 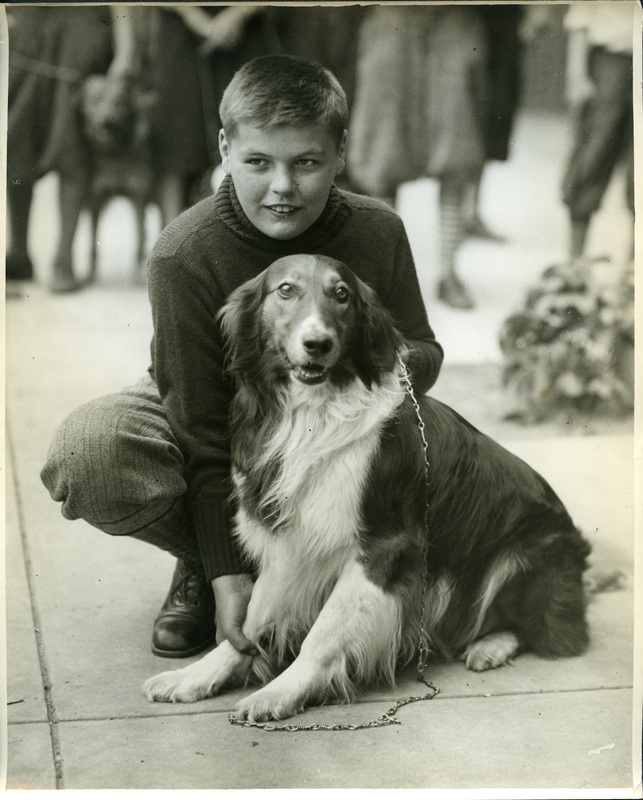 The day was so successful, in fact, that Boston Children’s Museum hosted another Pet Show the following year, on June 22nd, 1929. That year, descriptions of the pets and their owners made the front page of the Sunday Boston Post. 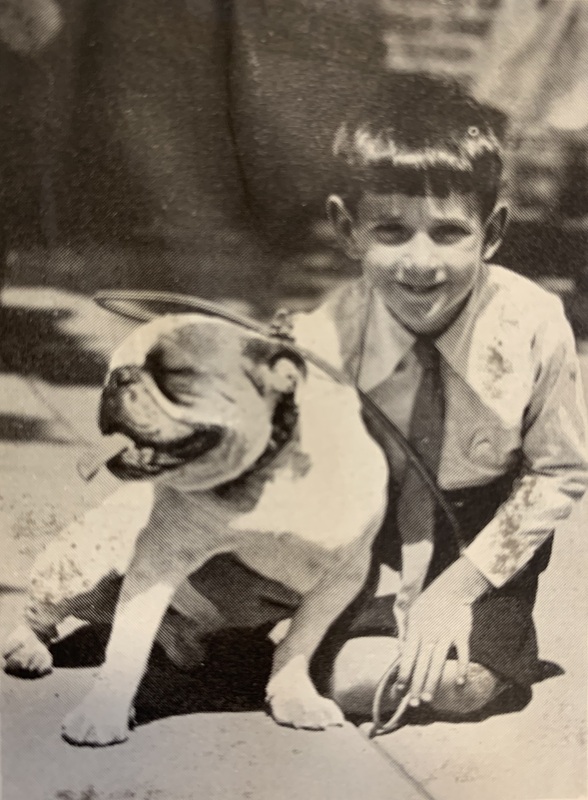 This was probably partially in thanks to 5 year-old Francis Curley (son of former mayor James M. Curley) and his rambunctious English bull dog. 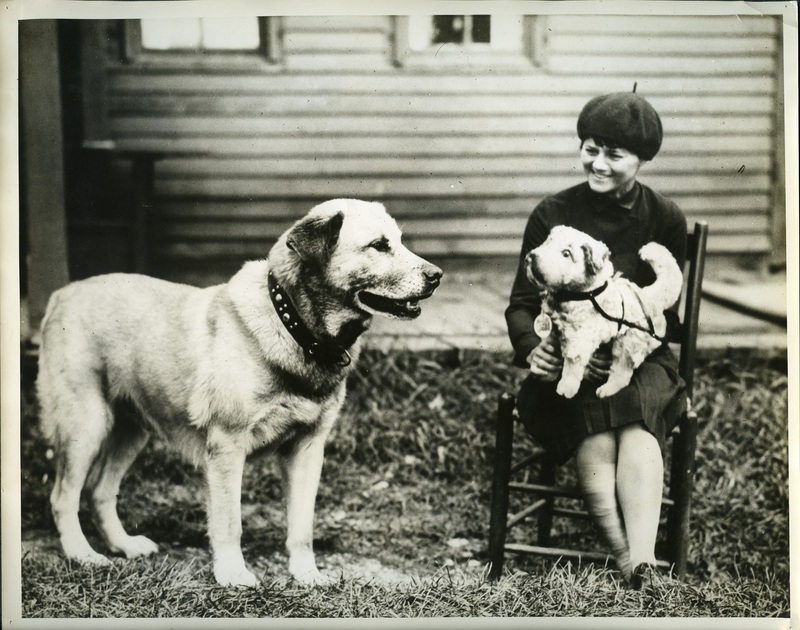 The Pet Show of 1929 wrapped up in similar fashion, with Russell Keller and Sophie Khyskow winning first and second place for the essay competition. The stories one finds in the Archives at Boston Children’s Museum are often exciting and adorable. They can be traced through the vast range of materials in the collections. If you have any stories, events, clubs, or people that you want to learn more about, please email Caroline at turner@bostonchildrensmuseum.org.